And yes -- note the seasonal nature of my greeting! There are indeed blossoms busting out all over here in San Francisco. What's it like in your neck of the woods?? The trees around here seem to think it's spring. I'm less certain, though it's definitely sunny, outrageously windy, and I'm sneezing a lot. A little bird was merrily and noisily splashing in the birdbath out in back of my house, too, and all of these things seem to be signs of spring. Over there to the left is one of my readers, Bethany Hensel, who works for a hot new magazine in PA called Lux—here's their new blog. 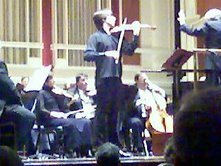 And that delicious man she's with is none other than Joshua Bell, violin ist extraordinaire, who's on my hot guy list. :) She had an opportunity to meet him a few weeks ago and she shared these photos with me. His talent is superhuman—in his hands, a violin seems like a living thing, with a full range of emotions. And here's our theme song for the day, and my valentine to you: Ave Maria as played by him. Sorry you had a stinky day, Bethany!! But the weekend is almost here, and so is spring. 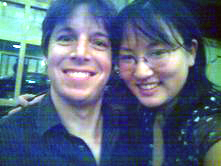 :) And you got to take a cheek to cheek photo with Joshua bell...((((envious sig))). LOL. A memory to savor! Oh you are so right!!! The cheek to cheek action will be remembered forever! Haha. I think I've told about oh, two million people about your post so far. I can't help it!!! Good luck on the title! I have every faith that it'll be wonderful! Hope the weather is cooperating... we finally, FINALLY have some sun today ~ it's been a long time. I know, we're spoiled here with the sun and blue sky. Hey Kathy! Glad you're getting some sun and blue sky!! Are you going nuts with all the little ones?? Here...well, i can see the fog sitting way out there on the water...it rolled back this morning to give us mostly blue skies, but I really don't want it to roll back in -- which it might just do this afternoon -- because i'm trying to air-dry a big freshly washed wool rug out on the balcony. LOL. I lead a very, very glamorous life. :) I'll have to keep a sharp eye on the weather. LOL. Hope the fog stays out for the day... blue skies make such a difference! Oooooh, I LOVE that "Ave Maria." I've been lucky to see him in concert once. Unbelievably talented (emotionally and technically). Lucky Keira!! I've missed Joshua Bell when he's guested with the SF Symphony, but I don't plan to miss him again!! I'm sure he'll be back. And that Ave Maria is so beautiful, but I love watching him play the wilder stuff, too. They have a pretty hot video of him doing Paganini on YouTube. "a pretty hot video of him doing Paganini on YouTube"
I found a video of Bell playing a soprano aria O Mio Babbino Caro. Absolutely swoon-worthy. ROFL!! Oh, man, Keira. I totally laughed out loud. Everyone's probably going..."wait...if there's a hot video of Joshua Bell doing Paganini, won't I need my credit card to see it??" It's a wonder that violin doesn't burst into flames. It'll break your heart in the sweetest sort of way.